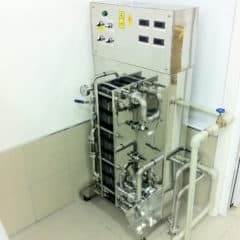 This equipment is used for condensation and removal of vapors generated in boiling equipment during the brewing process.The vapor condenser BVP-400 allows suction of vapor from the container by ventilator and subsequent condensation in a tubular heat exchanger. From the heat exchanger then goes only condensed liquid of substantially lower temperature, which do not shorten the lifetime of the waste-pipe of the brewhouse. Drinking hot water (as coolant) outgoing from the heat exchanger is able to be collected in the hot water tank for later use. 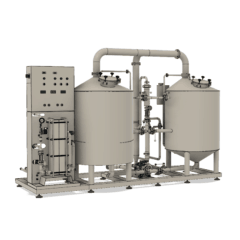 This equipment is used for condensation and removal of vapors generated in boiling equipment during the brewing process.The vapor condenser BVP-600 allows suction of vapor from the container by ventilator and subsequent condensation in a tubular heat exchanger. From the heat exchanger then goes only condensed liquid of substantially lower temperature, which do not shorten the lifetime of the waste-pipe of the brewhouse. Drinking hot water (as coolant) outgoing from the heat exchanger is able to be collected in the hot water tank for later use. 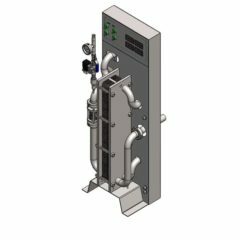 This equipment is used for condensation and removal of vapors generated in boiling equipment during the brewing process.The vapor condenser BVP-1000 allows suction of vapor from the container by ventilator and subsequent condensation in a tubular heat exchanger. From the heat exchanger then goes only condensed liquid of substantially lower temperature, which do not shorten the lifetime of the waste-pipe of the brewhouse. Drinking hot water (as coolant) outgoing from the heat exchanger is able to be collected in the hot water tank for later use. 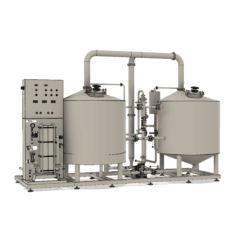 This equipment is used for condensation and removal of vapors generated in boiling equipment during the brewing process.The vapor condenser BVP-1500 allows suction of vapor from the container by ventilator and subsequent condensation in a tubular heat exchanger. From the heat exchanger then goes only condensed liquid of substantially lower temperature, which do not shorten the lifetime of the waste-pipe of the brewhouse. Drinking hot water (as coolant) outgoing from the heat exchanger is able to be collected in the hot water tank for later use. This equipment is used for condensation and removal of vapors generated in boiling equipment during the brewing process.The vapor condenser BVP-2000 allows suction of vapor from the container by ventilator and subsequent condensation in a tubular heat exchanger. From the heat exchanger then goes only condensed liquid of substantially lower temperature, which do not shorten the lifetime of the waste-pipe of the brewhouse. Drinking hot water (as coolant) outgoing from the heat exchanger is able to be collected in the hot water tank for later use. 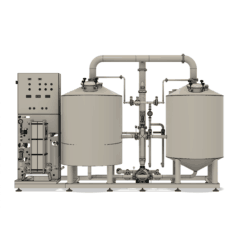 This equipment is used for condensation and removal of vapors generated in boiling equipment during the brewing process.The vapor condenser BVP-3000 allows suction of vapor from the container by ventilator and subsequent condensation in a tubular heat exchanger. From the heat exchanger then goes only condensed liquid of substantially lower temperature, which do not shorten the lifetime of the waste-pipe of the brewhouse. Drinking hot water (as coolant) outgoing from the heat exchanger is able to be collected in the hot water tank for later use. 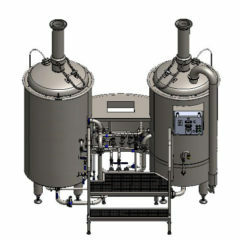 The BVP-3000 set includes two the same independent vapor condensers. This equipment is used for condensation and removal of vapors generated in boiling equipment during the brewing process.The vapor condenser BVP-4000 allows suction of vapor from the container by ventilator and subsequent condensation in a tubular heat exchanger. From the heat exchanger then goes only condensed liquid of substantially lower temperature, which do not shorten the lifetime of the waste-pipe of the brewhouse. Drinking hot water (as coolant) outgoing from the heat exchanger is able to be collected in the hot water tank for later use. 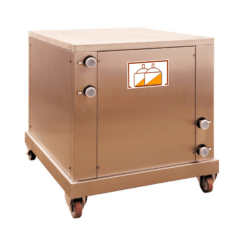 The BVP-4000 set includes two the same independent vapor condensers. The wort brew machine BREWORX LITE-ECO 300 is a compact food machine which includes all necessary equipment to produce 330 liters of wort (for production approximately 300 liters of beer) in one batch from malt extract or wort concentrate (beer concentrates). The machine is not equipped with the filtering tank therefore it is not possible to produce wort from malt classic way. 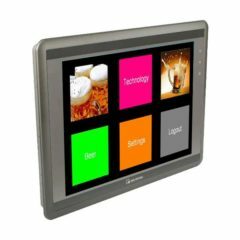 A simplified industrial design of the machine allows effective work during entire wort production process using simple step PLC controller for heating of the vessels. Transfer of heat from the electric heating spirals to inner jacket of the vessels ensures oil. This wort brew machine is a main equipment of the BREWORX Lite-ECO 300 breweries but it can be use also with other type breweries too. The wort brew machine BREWORX LITE-ECO 600 is a compact food machine which includes all necessary equipment to produce 660 liters of wort (for production approximately 600 liters of beer) in one batch from malt extract or wort concentrate (beer concentrates). The machine is not equipped with the filtering tank therefore it is not possible to produce wort from malt classic way. 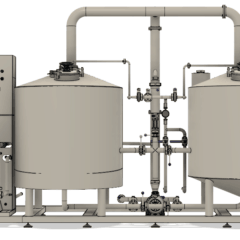 A simplified industrial design of the machine allows effective work during entire wort production process using simple step PLC controller for heating of the vessels. 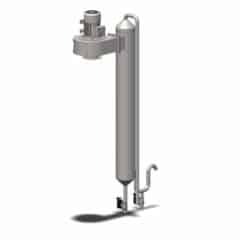 Transfer of heat from the electric heating spirals to inner jacket of the vessels ensures oil. This wort brew machine is a main equipment of the BREWORX Lite-ECO 600 breweries but it can be use also with other type breweries too.